This Paleo Chicken and Peaches Recipe Packs a Spicy Punch. 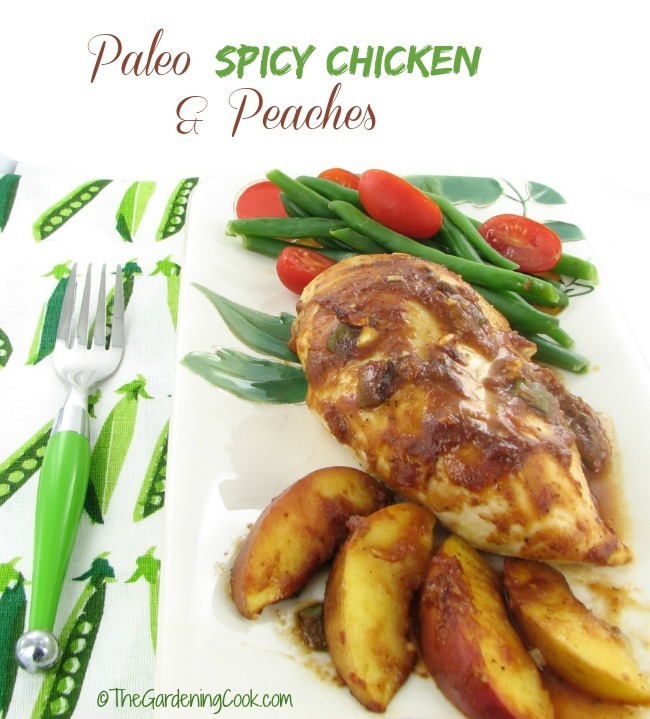 This Paleo Chicken and peaches recipe is slightly sweet and slightly spicy. The dish is full of flavor and so easy to make. The base of the sauce for this dish is Steve’s Paleo Peach BBQ. (sponsored link) It’s perfect for grilling any protein, but for this dish, I wanted to focus on the peach flavor, so I added fresh peaches and enhanced the sauce and baked it in my oven. It was wonderful. Just a hint of the peach, but with some extra heat, which pleased my heat loving husband. But it was not too spicy. Really flavorful and so moist. I find that cooking chicken on the grill can sometime dry it out, so into the oven it went! To make the dish, first do the marinade. I combined 1/2 cup of the peach BBQ sauce with spring onions, minced garlic, and some chicken stock. I heated it on the stove top for just a few minutes. 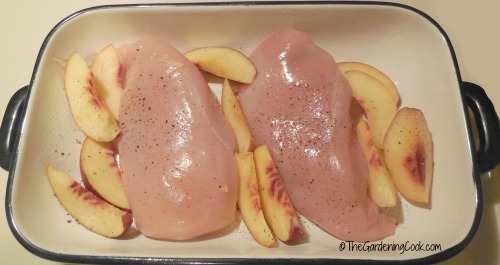 Layer your chicken and sliced peaches in an oven proof baking dish. Just pour over the sauce and bake in a 350º F oven for about 30-40 minutes until the peaches are soft and the chicken in no longer pink inside. I served this dish with some steamed green beans and grape tomatoes. It was divine. Not too much heat, a hint of sweetness and so moist and juicy. This is one I will be making again. Paleo, Gluten free and low in calories, too! Note: I received a bottle of this Sauce to try for free to test in my recipe. I only recommend products that I feel are good for my readers. 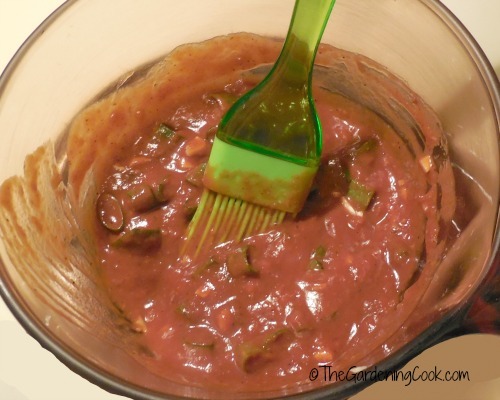 I loved this sauce. If you are looking for more Paleo goods, be sure to visit Steve’s Paleo Goods. 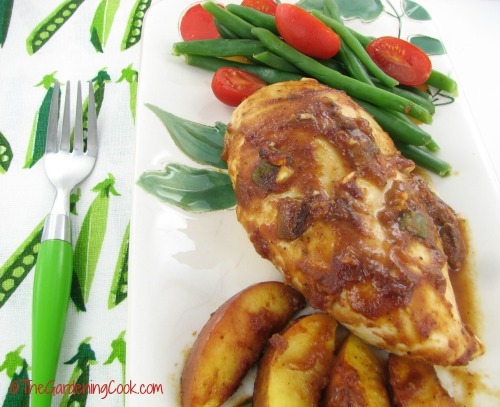 Preheat the oven to 350º F. Layer the chicken and peaches in an oven proof baking dish. Combine the BBQ sauce, chicken broth, and spring onion in a sauce pan and heat for a few minutes to blend the flavors. Pour over the chicken and peaches and cook for about 30-40 miinutes, until the peaches are softened and the chicken is cooked. Serve with some steamed veggies or a side salad. Enjoy!